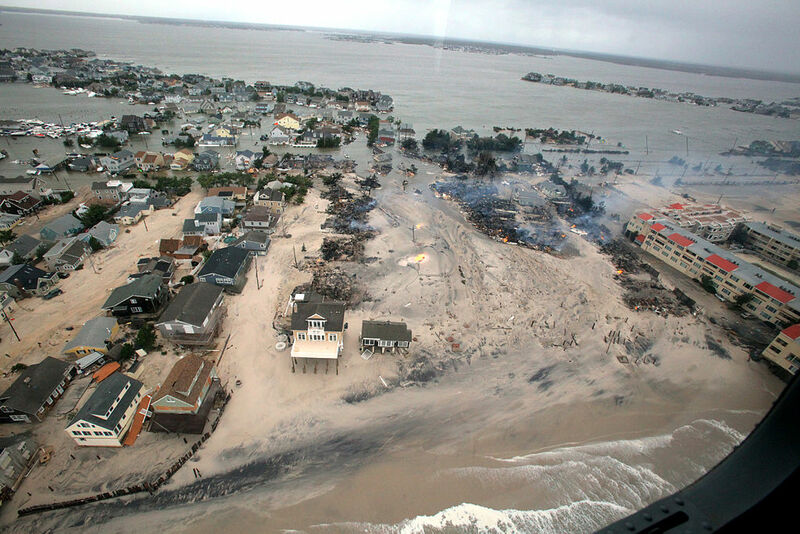 Hurricane Sandy taught New Jersey the importance of planning to protect people and property more effectively from storm-related damage. Two recent reports offer a useful approach to understanding vulnerabilities and pinpointing ways to address them. While the projects operated at the municipal level, they could inform state and regional approaches as well. 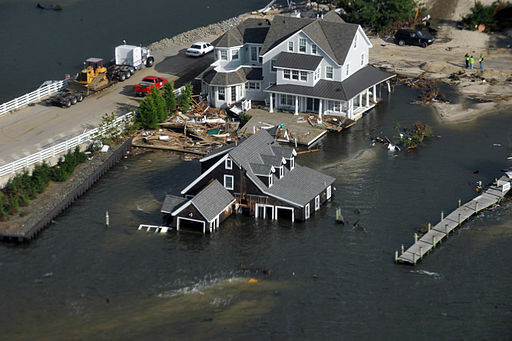 Three communities — Oceanport, Little Silver and Cape May Point — comprised the NJ Sea Grant Consortium‘s December 2010 New Jersey Coastal Community Resilience Demonstration Project. 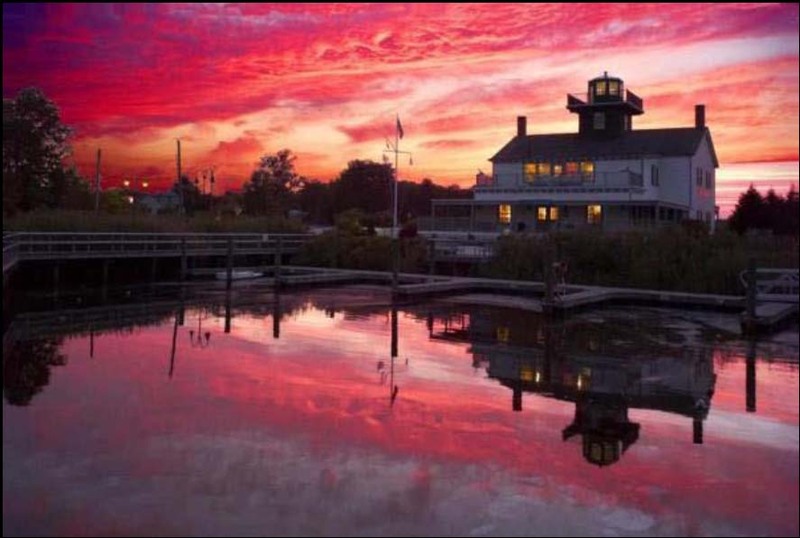 A fourth community, Greenwich, was highlighted in a June 2011 report, all released by the consortium and its partners at NJDEP’s Office of Coastal Management, Monmouth University Urban Coast Institute and the Stevens Institute of Technology. Local officials participated throughout. 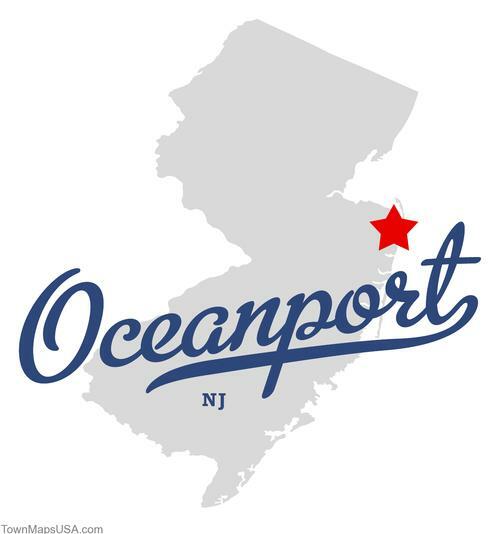 Highlights of the analysis and results for Oceanport help describe the project’s scope. 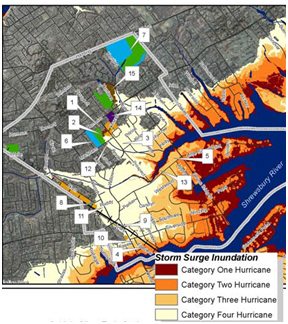 This GIS-based methodology identifies areas where built infrastructure and community facilities, sensitive natural resources and special-needs populations overlap with areas of potential inundation from storm surge. In Oceanport, for example, the First Aid and Rescue Squad (area 4 on the map at left) would be partially inundated in a Category One hurricane and totally inundated in a more severe storm. The municipal building, police department, library and public works (area 1) would be surrounded by floodwater in a Category One hurricane, and so on. Other maps depict the location of vulnerable populations and natural resources likely to be affected by hurricanes. The mapping project also shows areas that would be flooded under three levels of sea level rise: +.5 meters, +1.0 meters, and +1.5 meters (see map below). 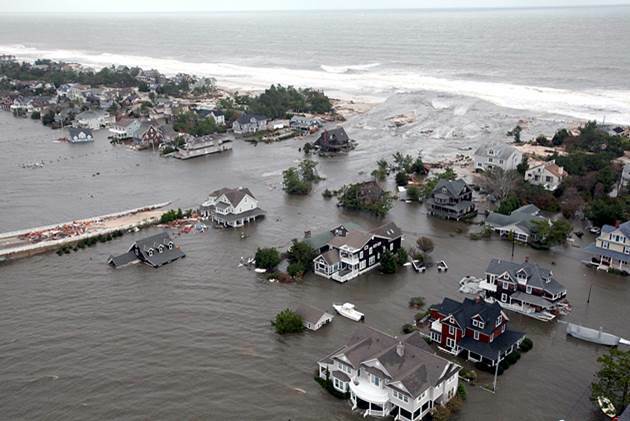 It then projects how those various levels of sea level rise would affect land that is otherwise vulnerable to coastal hazards. The result is a better understanding of how high-hazard areas will change over time, increasing in size and shifting inland. For the demonstration project, the questionnaire was facilitated in a focus group session involving municipal and county planners and experts and local officials across multiple disciplines. The desirability of identifying shared evacuation shelters in neighboring municipalities, since the municipal buildings and one elementary school are subject to flooding, and the other elementary school is reserved as an evacuation shelter for emergency responders and their families. The redevelopment of Fort Monmouth serves as an opportunity to develop in concert with nature, but the Fort Monmouth Redevelopment and Reuse Plan proposes the location of new development in an area prone to flooding and susceptible to storm surge. 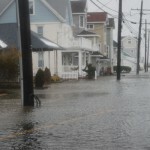 Oceanport has taken many steps to inform its residents of its flood vulnerability but could provide better information on ways to retrofit their homes to make them more resilient. It would be interesting to interview local officials involved in the demonstration projects to learn whether they have been acting upon the findings and if their involvement assisted them during the storm. 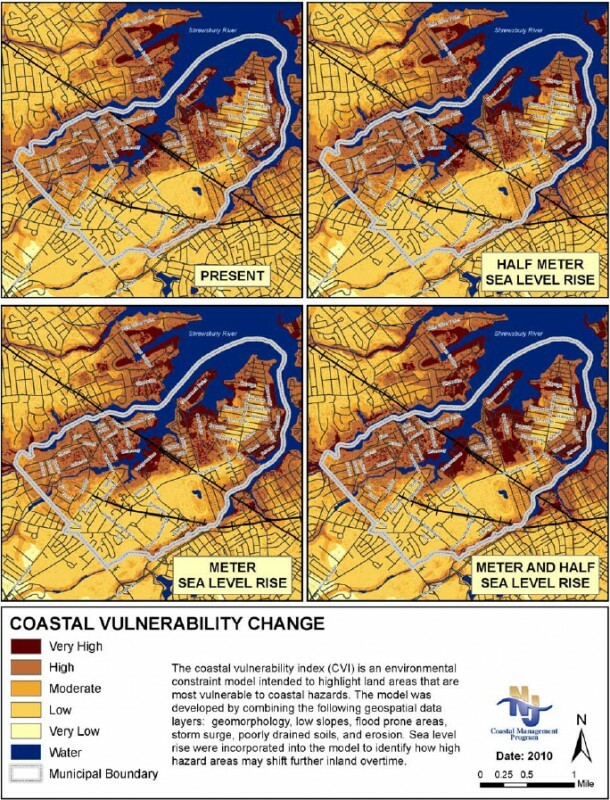 One could imagine similar vulnerability assessments and resiliency questionnaires being conducted throughout the shore region, and in a modified fashion through the state to enable communities make science-based decisions for a more resilient future. Sustainable Jersey will be releasing a web-based sea-level-rise viewer and a version of the planning and preparedness checklist at their Climate Adaptation Forums in January. A regional-level assessment could assess vulnerabilities of regional-scale infrastructure and facilitate better land use planning. Let us know what you think!